short sleeve styles. We also customize tuxedo shirts with a straight, band, or wing tip collar in quarter or half inch pleated fronts. If you prefer, Rocco will duplicate any item you already own. With more than three thousand fabric selections annually, we are sure that you will always find that special one to complement your wardrobe. 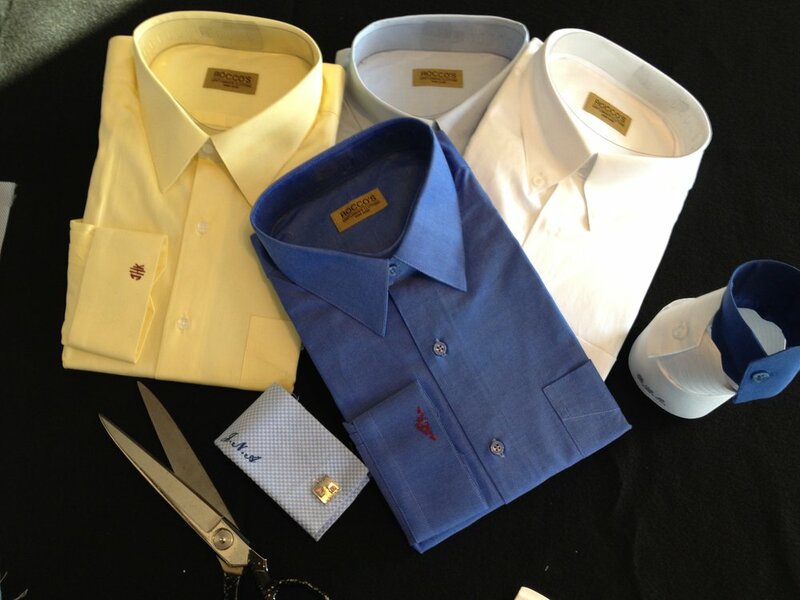 Your Custom Shirts are hand crafted from your designed paper pattern to your different shoulder slopes, with two different sleeve lengths, two cuff sizes and your correct collar height in a European, traditional, or full cut. Crafted in quarter inch increments, your shirts take form sewn with twenty one to twenty six stitches per inch. Our collars, cuffs, and front pleats are crafted in a three ply form to insure a professional look, even if you prefer no starch.One way to explain the feeling of owning Rocco’s Custom Shirts, is to think of those times when you reach into your closet expecting your hand to land on that favorite shirt, with Rocco’s Custom Shirts that feeling is there each time. The majority of our imported fabrics are priced from $145.00 to $175.00. With a proven life expectancy of three to five years based on weekly laundering. It would be difficult to find all of these benefits and personalized services in a ready made shirts.